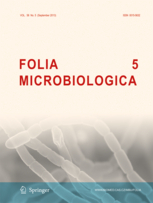 Folia Microbiologica – Institute of Microbiology of the CAS, v. v. i. For the past fifty-plus years the journal has served as a publication forum for microbiologists all over the world. It accepts papers on basic and applied topics, emphasizing modern approaches and technologies. Excerpta Medica (EMBASE), MEDLINE, Research Alert, and Veterinary Bulletin. of their articles to the general public. Please visit the journal homepage at springer.com for more information about, and to take advantage of, these new features.